Here's something to look for when you run across an unusual example of the large Tonka flatfender toy: "Made in Canada" stamped in tiny letters in the indentation on the windshield frame. From approximately 1965 to 1968, a large number of Tonkas built in Toronto, Canada, were slightly different from those built in Mound, Minnesota, USA. This hard-to-find Royal Canadian Air Force Jeep is perhaps the most distinctively Canadian of the Tonkas built in Toronto. See a photo of a mint example of the RCAF Tonka with its original box (50K JPEG) at Harold Carlaw's Memorial Military Museum in Campbellford, Ontario. The RCAF Jeep has generic "Tonka" decals on both rear fenders, rather than the usual "Tonka Toronto, Can." decal (see below). But with the Canadian flag on the hood, this one isn't hard to identify as made in Canada. It is also apparently the only Toronto Tonka to have a spare tire. 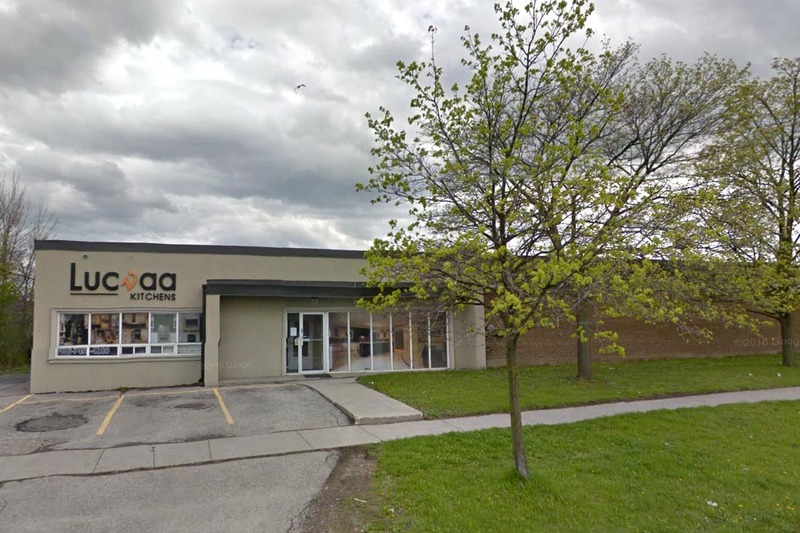 The Canadian Tonkas were made at 5 Racine Road in Toronto. 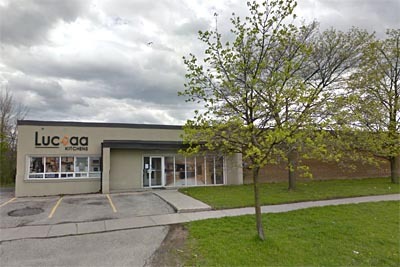 Records at the Toronto Archives show that Mercury Tool and Stamping Ltd. was the name of the operation from 1965 to 1967. According to the Tonka Chronology at NeatOldToys.com, Tonka Toys Inc. acquired a 3-year option to buy controlling interest in Mercury Tool and Stamping on 22 June 1964. The name was changed to Tonka Canada, still with Peter R. Stevens as President, in 1968, its last year of operations. The small size of the surviving building supports the theory suggested by examining the toys themselves, that while some parts were made in Toronto, other parts were imported from the U.S. Most of the Canadian Tonkas carried an identifying "Toronto, Can." decal, similar to the Mound, Minnesota decal used in the U.S. (although without the flattened bottom edge). The decals varied slightly in size, lettering, and location (rear or side) in different years. See a later, smaller version (50K JPEG) on the side of a Tonka Wrecker. The Jeeps were still produced in Canada as late as 1967-68 using the old-style three-piece bodies with seams in the hood. These bodies had been replaced in the U.S. by one-piece bodies in 1964 (see How to Date Your Tonka Flat-Fender). The old body style was probably a bit slower to produce and required more labor to assemble, but Tonka Canada was supplying a much smaller market. The Canadian Jeeps used the same wheels, whitewalls and hubcaps as the U.S. versions, and they also evolved gradually as parts were changed. Apparently Tonka Canada was using some parts shipped from the United States, on bodies stamped in Toronto using the tooling for the old three-piece body. Click on any of the photos above for a larger copy (30K JPEGs). 1965: The light blue Jeep with the solid disc hubcaps dates from the earliest Canadian production, probably 1965. The solid hubcaps, which were replaced by spoked hubcaps in the U.S. in 1963-64, are a bit of a mystery. They appear to be original -- perhaps they were leftover stock sent to Toronto for the initial production runs. 1966: Spoked hubcaps soon arrived in Toronto, and were used on the RCAF Jeep and other models. Many of the Canadian windshields were white, while most of the U.S. models now had body-color windshields. 1968: Tonka Canada continued to use the old-style axles with the hammered ends, after Tonka in the U.S. had switched to axles with end caps (see How to Date Your Tonka Flat-Fender). The new, slightly longer axles required deeper hubcaps, recognizable by the ridges running along each spoke. These hubcaps were also shipped to Toronto, where they were used with the old axles, as on the peacock green Dispatcher seen here. 1970: The blue wrecker is perhaps the only Tonka Canada product with the one-piece body which had been adopted in 1964 in the U.S. As well, the new flat windshield no longer carried the "Made in Canada" stamp. The wheels have new, wider tires, which according to Bob Miller did not appear until 1970. This rarely-seen white version of the Canadian wrecker/snowplow, similar to the wrecker built in the U.S., has a metal-base warning lamp on the hood (see a front view photo, 16K JPEG). Its early-style body and late-style hubcaps suggest a possible date of manufacture of 1967. The new plastic warning light was used on some of the white wreckers, and on the more-commonly-found blue version, whose new body and larger wheels suggest 1968. The plastic interiors in the Toronto Jeeps are also like the older U.S. models. The newer U.S. interiors had a little blister on the back bottom corners of the seats to hold the wrecker boom, but the Tonka Canada wreckers still used the old seats without the blisters. 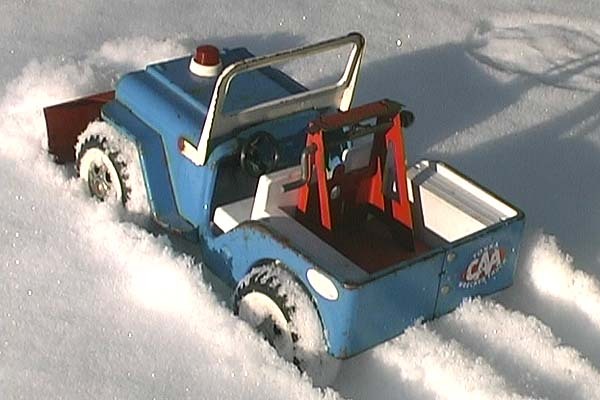 Some of the blue wreckers don't have the "CAA Tonka Wrecker Truck" decal -- it has been suggested that use of the logo was suspended because of a dispute between Tonka and the CAA. Its presence on the two different versions above suggests that it was in use for more than a year. Back in 1959 the first "Harvey's" restaurant opened in Richmond Hill, Ontario, offering a fast-food hamburger that was char-broiled and with a choice of nine garnishes. In 1965 Harvey's Foods Limited was formed by combining Harvey's and Swiss Chalet, and fast food was on its way to becoming big business. One of Harvey's promotions was this "Jeep 4 Wheelee" Mini-Tonka Jeep (the smaller 6-inch version of the flatfender toy). Presumably it was manufactured by Tonka Canada. Any further details on this toy would be welcome. Why a Royal Canadian Air Force Tonka? Was the RCAF Tonka also inspired by some particular occasion? Or simply because of the popularity of the U.S. Air Force Tonka (30K JPEG), and perhaps the USAF pedal car Jeep built by Hamilton (40K GIF)? I took this photo at the Royal Military College of Canada, with an actual RCAF F-86 Sabre Mark 5 on display in the background. The RCAF Sabres were the first line of NATO air defence in Europe during the CJ-3B era, from 1952 to 1963, and in their prime were the fastest aircraft in the world. The record of the Canadian-built F-86 for the U.S. Air Force against the MIG in Korea was 975 MIGs lost for 78 Sabres lost. The jet displayed at the College is in the colours of the 441 Fighter Squadron of the RCAF. Incidentally, I am interested in finding information about real CJ-3Bs which may have been used by the RCAF or the Royal Canadian Navy. See more photos of some of these Canadian Tonkas, in Tonka Jeeps Are CJ-3Bs. Also on CJ3B.info, see the real Kaiser Jeeps Made in Canada, 1959-69, and more Tonka Jeeps on the Toy Jeeps Pages.